career as an artist working first as a compositor for the printer F.D. Finlay on the newspaper the Northern Whig. 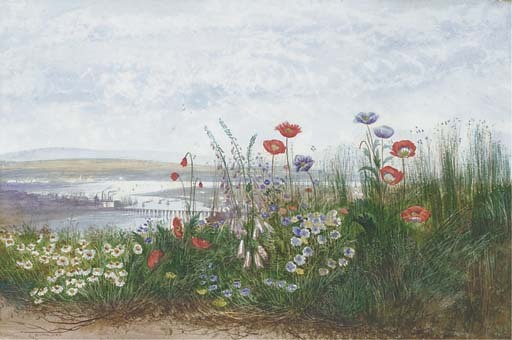 He had already gained local recognition as an artist when in 1830 he travelled to London where his style developed under the partronage of Emerson Tennent. Nicholl spent time copying Old Masters at the Dulwich Picture Gallery where his favourite artists were Cuyp, De Wint and Copley Fielding. It was at Dulwich that he also saw his first works by Turner, an artist who remained a major influence throughout his career. From 1832 he exhibited at the Royal Academy and the Royal Hibernian Academy, of which he was elected an Associate in 1837 and a full member in 1860. In 1846 Nicholl was sent to Ceylon to take up the post of drawing master at the Colombo Academy. On his return he lived in Belfast and London and made frequent visits to Dublin. accurately observed topography beyond. Nicholl used Turner's technique of scratching out to highlight his foliage and also John Glover's split brush technique. The first bridge built across the River Foyle, Derry, was a wooden structure erected in 1789-91. The structure allowed for a drawbridge as the inhabitants of Strabane had navigational rights to the river. It was built between Bridge Street and Fountain Hill. The second bridge was a steel structure built in 1863 a little further upstream near the site of todays Craigavon Bridge. A similar watercolour by Nicholl was sold at Christie's, London, 19 May 2000, lot 122 (£19,800).